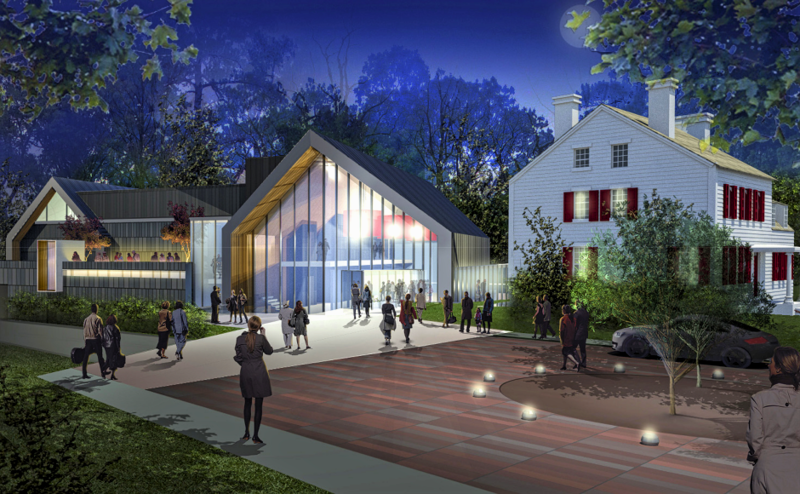 Haddonfield commissioners will allow the arts group to perform traffic, stormwater, and other feasibility analysis at the historic site to determine whether it can be transformed into a theater and cultural center. Haddonfield Commissioners. Credit: Matt Skoufalos. 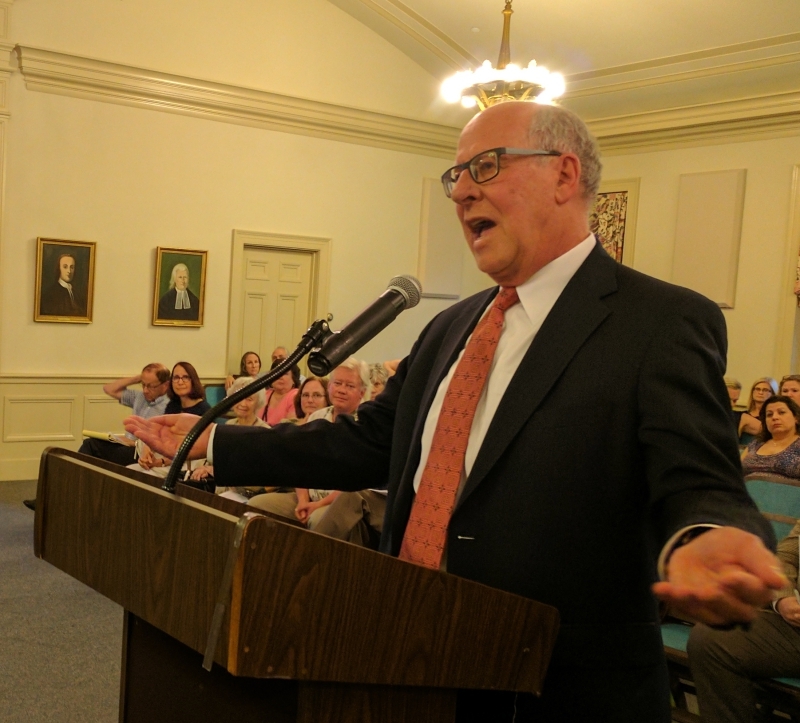 After an hour’s worth of objections from residents in the immediate neighborhood, Haddonfield commissioners voted Tuesday to allow an arts group to prepare plans to redevelop the historic Boxwood Hall into a performance venue and cultural center. 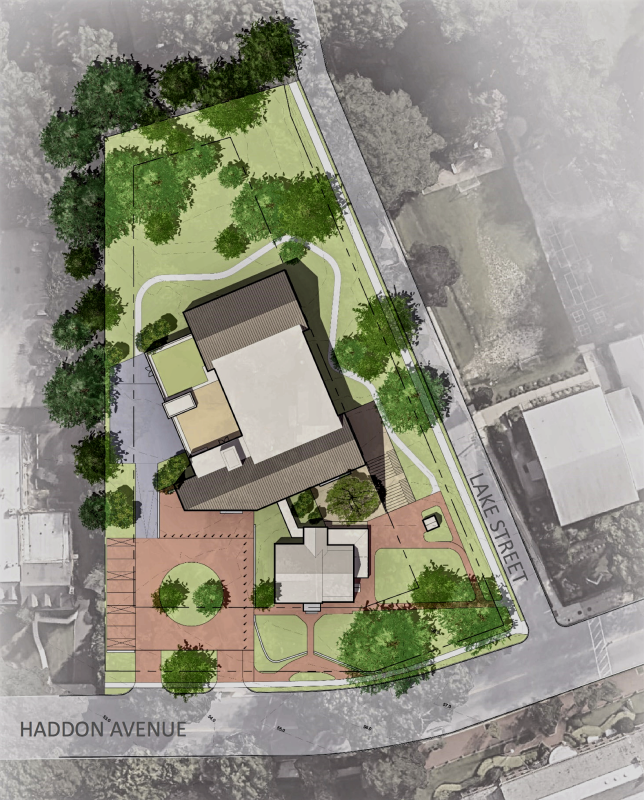 At last week’s caucus meeting, the local government heard the first official presentation from the organizers of the Boxwood Arts Theater and Cultural Center, a group that announced its plans for the site in October. 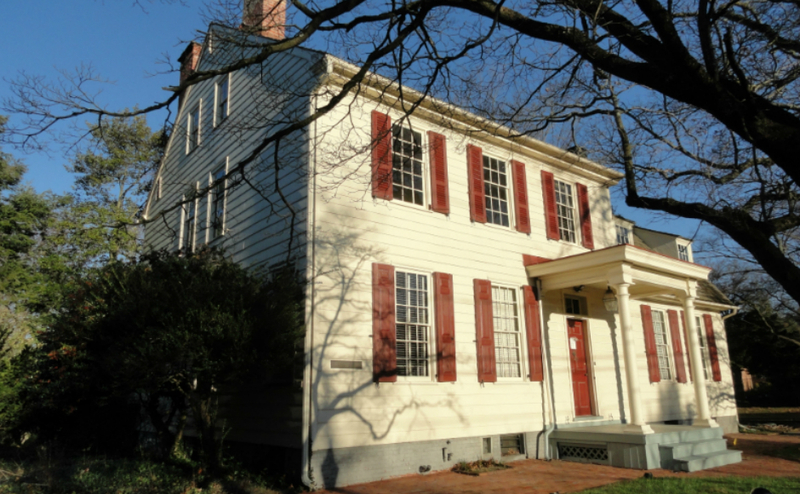 Their proposal would restore the historic John Estaugh Hopkins House, known as Boxwood Hall, for use by the Markeim Arts Center as a public gallery, while adding a 4,000-square-foot ballroom for Dance Haddonfield, and a 365-seat performance venue that would become the new home of Haddonfield Plays and Players. Without permission from the local government, the project could not have advanced. The borough purchased the property in 2014 to resolve a builder’s remedy lawsuit that would have situated a 33-unit apartment building on the site. After Monday’s action, the Boxwood Arts group will have one year to prepare stormwater, traffic, parking, and other engineering plans, and make a formal application for the project before the borough historic preservation, zoning, and planning boards. If it fails to clear any of those hurdles locally or at state levels, the proposal will fizzle out. Left up to residents of the surrounding neighborhood, however, the concept would already have been junked, as nine or ten of them took the podium Tuesday to voice their objections to the plan. 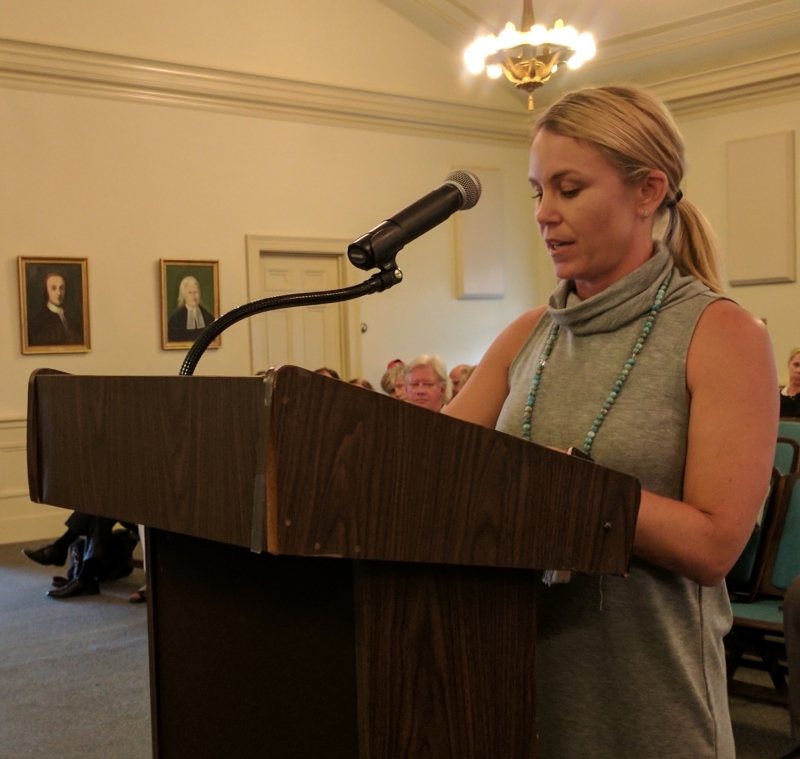 Lake Street resident Kristen Poliafico, whose home borders the property, asked the commissioners to consider the immediate impact of situating an arts facility in the historic neighborhood. She fretted that the project would pack the narrow surrounding streets with cars and keep residents up with noise. Showing photographs of the street during heavy rainfall, Kenneth Tomlinson of the adjacent Hinski-Tomlinson Funeral Home said he believed the project wouldn’t pass muster for stormwater management. “You put a building there, it’s going to flood out my backyard and my front yard,” Tomlinson said. Kristen Poliafico. Credit: Matt Skoufalos. Most directly affected by any changes to the site were Matthew and Theresa Dougherty, whose family rents a home on the Boxwood Hall property. Matthew Dougherty described the site as a place of refuge that is “harmonious with the rest of the street” and which “should[n’t] be interrupted in any way. “Because some people want to build a theater, they’re willing to take away our home for that,” he said. His sister, Theresa Dougherty, was less charitable, calling the proposal “a disgusting, meaningless project. Lake Street resident Kathryn Raiczyk asked the commissioners to consider the narrow width of the streets in the surrounding neighborhoods. “Sometimes I can’t get out of my driveway because of how someone’s parked on the other side of the street,” Raiczyk said. Kim Custer. Credit: Matt Skoufalos. 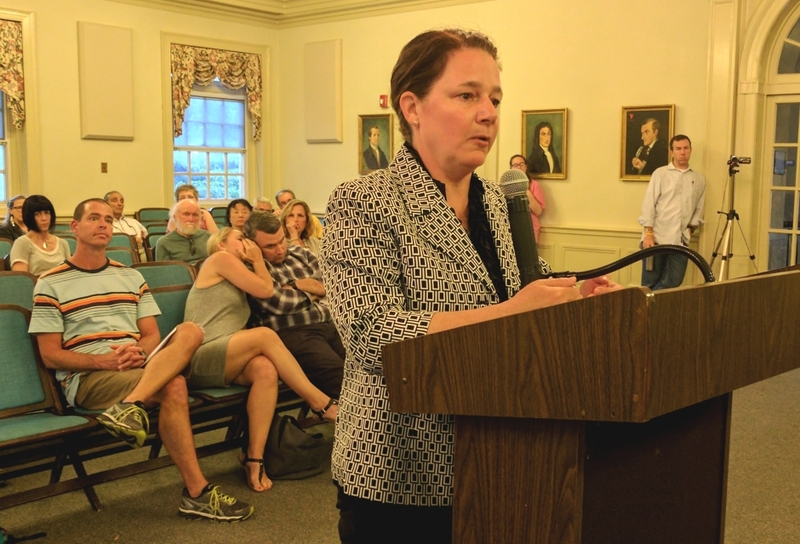 Haddonfield resident Kim Custer, who led a preservationist push to forestall the prior development plans for the property, called the Boxwood Arts proposal “insulting” to the years she’d spent fighting prior redevelopment plans for the site. “I think I’d rather have housing there than this project,” Custer said. “It has to stop. “You’re putting the planning board, the zoning board, and the historic preservation commission through a lot of hurdles that it doesn’t need to go through,” she said. Custer’s attorney Richard Hluchan, who had argued for the right to redevelop Boxwood Hall as an apartment complex in 2014, chastised the local government for even considering the arts center proposal. Richard Hluchan. Credit: Matt Skoufalos. After the crowd had exhausted its criticisms, principals from the Boxwood Arts group stepped up to defend their project. Dance Haddonfield President Philip Zoebisch said the space is necessary because his group has outgrown its current space at Grace Episcopal Church, where they’ve performed for the past 15 years. “We’re constrained by the size of the place,” Zoebisch said. “It’s hard to keep our intermediate dancers. We’re looking at a 4,000 square-foot dance hall. It would be fantastic. While appealing to cooler heads, Markeim Arts Center COO Bob Hochgertel tried to address what he called the chicken-and-egg question of the proposal. Hochgertel said the Boxwood principals had spent 18 months meeting weekly to discuss the particulars of the plan; paying out of pocket for financial analyses, architectural renderings, and similar research. He also apologized to the residents for not having consulted with them all before word of the proposal hit the media. “What I don’t like is when our actions are talked about in a way as if we don’t have the best interests of this town at heart,” Hochgertel said. “And we do. And it’s okay that we disagree. “We believe this is a choice made for the benefit of the town,” he said. “It’s not made out of malice or hubris. It’s made out of a similarly emotional place that the opposing comments came from. “All we’re asking for is the opportunity to explore this,” Hochgertel said. Commissioner John Moscatelli said the borough bought the property at the advice of counsel and with the intent of subdividing it into three parcels: the hall itself, the house behind it, and the public greenspace at its rear edge. Despite its historical protections, Moscatelli said the borough would have “no guarantee” that the property would be preserved in any extensive way or that its sale at auction could return the cash outlaid to buy it. He also noted how local Green Acres dollars were already dedicated to the purchase of the Bancroft parcel, which leaves few financial remedies available to the local government. “We’re not interested in maintaining a historic site for the sake of a historic site,” Moscatelli said. “We certainly don’t want to be landlords any longer than we have to. Just saying we’ll rent it out doesn’t make much sense. Boxwood Arts Theatre and Cultural Center. Credit: Boxwood Arts. Describing himself as an avowed supporter of both historic preservation and private property rights, Commissioner Jeff Kasko said he was most concerned by the potential problems of parking and traffic on the site. Yet he agreed that the project should be allowed to proceed in order to perform studies addressing those issues. Borough Counsel Mario Iavicoli said that although the theater proposal doesn’t conform to the existing permitted uses on the site, it could be granted a variance or the site rezoned to allow for it. Most of all, he said the Boxwood Arts group is entitled to the opportunity to pitch the project before the appropriate boards. “People are entitled to their day in court,” Iavicoli said. “You shouldn’t shut them out before they have a right to say anything. You may never get [what you’re asking for], but the borough is not going to shut you down without the opportunity to be heard.